Subject: Bigger than Ben Hur! We're comin' to get you " Sadman"
I give this little dust up about 2 weeks from GO to WOA !! The Secretary of State for Defence today (6 Feb 2003) informed Parliament of the plans for the deployment of RAF assets as part of contingency preparations for possible operations in Iraq. Like the Royal Navy, the RAF already maintains a significant presence in the Middle East region, routinely comprising about 21 aircraft and about 1,000 personnel. For more than a decade, the RAF has played an important part in patrolling and enforcing the Northern and Southern No-Fly Zones over Iraq, in order to provide the Iraqi people with some protection from their own regime. In carrying out this task they have, on many occasions, come under fire from Iraqi forces. In his statement to the House, the Secretary of State saluted the courage and professionalism of RAF personnel engaged on these duties. As part of our contingency planning over recent months, we have been considering what additional air capabilities might be required in the event of operations in Iraq. The details of this planning will continue to evolve. It is the nature of air forces that actual deployment can happen more rapidly than for maritime or land forces. But we envisage that in the days and weeks ahead, we will increase the RAF deployment in the region to around 100 fixed-wing aircraft supported by around 7,000 personnel, including members of the Royal Auxiliary Air Force. Additionally, numerous supporting organisations such as the Tactical Logistics Wing and squadrons from the RAF Regiment will also deploy. The force will be balanced and highly capable and will include a variety of aircraft types. Reconnaissance capability will be provided by additional Jaguar GR3 and Tornado GR4A aircraft. Air defence will be provided by Tornado F3 fighters, and offensive capability will be delivered by the Tornado GR4 and the Harrier GR7. These fast-jet aircraft will be supported by both VC10 and Tristar air-to-air refuelling tankers. Air Transport within the theatre of operations will be provided by Hercules tactical transport aircraft. C17 Globemaster and C130 Hercules aircraft will provide the airbridge between the UK and the theatre of operations. E-3D Sentry aircraft from RAF Waddington will undertake the Air Surveillance and Airborne Command and Control role. In addition to fixed wing aircraft, some 27 Support Helicopters and 1,100 support personnel will deploy as part of Joint Helicopter Command. In addition to our aircraft, helicopters and their support personnel, the RAF Regiment will deploy to provide Force Protection and Ground-Based Air Defence. Other supporting units such as the Tactical Logistics Wing, Tactical Communications Wing and Mobile Meteorological Unit will also deploy. This is a follow on from my story regarding my time in Aden fending off Soviet merchant seaman from disembarking in Aden during a period of political unrest. 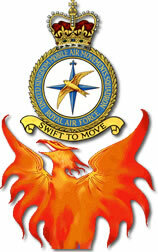 In 1978 - 81 I was Air Movements 1 at HQ38 Group RAF Upavon. It was during this time that I was sent out with a specialist group of air transporters led by the Group Captain (Air Transport), in a Lyneham Hercules on a circular trip to neighbouring countries around Southern Rhodesia - shortly to become Zimbabwe. The idea being that if the changeover of power in Southern Rhodesia was to become ugly, then Rhodesian expatriates would have to be airlifted to holding points near to Rhodesia. For it was estimated that the numbers of people who would be eligible for this evacuation could be large, and this evacuation to take place in the face of guerrilla forces fighting into the town of Salisbury. Well, we were flying between Chad and the Central African Republic when a Soviet aircraft in the vicinity called up our crew. They said that they were based in Aden and was there anyone on board our ac that had been based there. The navigator had, so he spoke to them. The gist of their conversation was: "Please come back and take Aden over as a British colony again; then we can all go back home to our beloved Russia". The navigator and I spoke about it and we could sympathise with their predicament: they were from one of the coldest areas of Northern Europe and they were on posting to one of the hottest areas of the world! I've recently purchased an apartment in Cornwall as an investment property. We exchanged contracts earlier this week and I've held off telling everyone until it was finalised. It is available to be rented for weekends (or weeks). I have attached a photo - amazing views!! I will handle the initial bookings myself, while I search for an appropriate Estate Agent to manage the property. Weekends will cost approximately £100 (friends and family rate) for two nights, and £250 for the week - bargain! Book early as the pad, with its amazing views of the local area will be popular. Please let me know if you are interested for your UK holidays! Looks like there's mischief about to begin here. "Always Broke" is a Loadmaster at Lyneham and I'm nearly sure who it is... I'll bide my time and refrain from retaliation yet! Just to say can you please send ''briefs'' to the following addresses. I have been getting 2 copies of the brief but they are both going to hotmail. Unfortunately ''hotmail'' service is becoming more erratic with less free space so I'm gonna bin it. On a lighter note ''Dibs Loveridge'' was over at my house last weekend, we also invited Colin (Biggles) Bignall over. I got all domestic and cooked up a hot curry ( no tomatoes Dibs ) and washed it down with lots of red wine and beer. I hadn't seen Biggles since 1984 and I think 1983 since Dibs saw him. Good night had by all from what I remember with one or two sessions of sandbagging/reminiscing involved. Have been out of the country for some weeks, left end of November last year for Singapore and then on to Perth and other places (sorry DC, did not make Queensland this time). On to NZ for three weeks and came home via LAX and SFX where we spent another week - were you on that trip to Moffett AFB April '74 where the Belfast Eng. took sick and we spent the weekend in SFX? It's all changed now. Back to the UK to be met by snow. Great trip we both enjoyed especially as we were upgraded to Business From Changi to Perth and then after making a fuss at SFX (second to check in to find there were no decent seats). Got moved into 1st - wow, that was luxury - far better than safari beds on a cold Herc floor. Have lots of your weekly OBA's to get through - great stuff and keep up the good work. Officer: I see...Can I see your vehicle registration papers please? Officer: Why not? Woman: I stole this car. The Officer looks at the woman and slowly backs away to his car and calls for back up. Within minutes 5 police cars circle the woman and a senior officer slowly approaches the car, clasping his half-drawn gun. Officer 2: The officer told me that you stole this car and murdered the owner. Officer 2: The officer claims that you do not have a driver's license. Officer 2: I must admit, Ma'am, that I'm confused; the officer told me you didn't have a license, that you stole this car, and that you murdered the owner. Woman: I suppose the lying b**tard told you I was speeding too. Having read your comments in respect of the subject matter and the unhelpful comments which only help to sustain and engender negative perceptions in respect of two of our regional minority communities, those of Liverpool and Bootle. I would ask you to think twice in future before including an item which sullies the name of all the decent, hard working people who live in the two areas you refer to. I was born in Liverpool, brought up in Bootle, spent over thirty years in the RAF and have returned to live in Liverpool because the people here are amongst the mostly friendly, helpful, open, honest and cheerful I have come across. It is easy to make remarks such as these, it is difficult to undo the harm they cause." I thought seeing that you got around a lot you might remember a place in Pakistan. When passing through Maripur in 52 we went u/s and had to stay a few days for an engine change. Seeing we were bored rigid the Transit staff arranged for us to have a day out at the beach. As you will remember they arn't that great close to town but they had a place some miles out for weekends etc. It was by the beach with nothing else about except the odd camel train passing by and the whole place was built up from WW2 aircraft packing cases facing right onto the water. The swimming wasn't much as you only went in close to the shore due to sting rays and sharks out near the reef area. After telling you all this what I want to know if it was called 'Hawkesbay' as that name sticks in my mind. Karachi is not a place I'd want to spend time at and you may know that the only mutiny the RAF had was there in 1945. An LAC Cybalist led a sit-down strike as their demob was being put back a long time after the end of the war. They were due out as time-ex conscripts and he got jailed for this escapade. Suppose you are still busy with your Association etc and it must be a lot of work. Young recruits to the Armed Forces must be eased into military life if they are not to pick up their mobile telephones and ask their mothers to take them home, the Ministry of Defence said yesterday. Lt-Gen Anthony Palmer, Deputy Chief of Defence Staff (Personnel), said the Forces had to recognise that modern recruits came from backgrounds radically different to those of previous generations and would not tolerate mindless discipline or routine. "They come to us with little deference or respect," said Lt-Gen Palmer. "If a corporal shouts at them, they say, 'Stuff you. I'm on my way.' They get on the mobile and mum picks them up." His remarks came during the publication of an MoD review of initial training in all three Services which has produced a flurry of recommendations intended to ensure more recruits stay the course. The review, carried out by two senior officers, is bound to be seen as an attempt to head off criticism of the MoD before the conclusion of an investigation by Surrey police into the fatal shootings of four recruits at the Royal Logistic Corps training centre at Deepcut. The inquiry has already uncovered a culture of bullying, sexual harassment and a lack of firearms supervision at the base. In addition to recommendations on bullying, the review includes proposals to set up alcohol-free internet cafes allowing recruits more contact with their families and friends, the creation of "covenants" setting out the obligations of trainers and trainees, and more uniform guidance on the sexual conduct in the ranks. Couched in jargon worthy of a management consultancy, it also proposes that recruits be guaranteed confidential access to officers on issues of personal welfare. Adam Ingram, the Armed Forces Minister, said the review, commissioned in October, was not linked directly to Deepcut. However, personnel at the base had been specifically excluded from a survey of 2,400 recruits and instructors carried out as part of the exercise. There will be concern at the finding that eight per cent of recruits questioned admitted to having been bullied during training. Air Chief Marshal Sir Anthony Bagnall, Vice-Chief of Defence Staff, said he and his colleagues had no intention of presiding over a deterioration in military discipline and operational effectiveness, but times had moved on. He said: "I don't believe that we are turning out namby pambies. Youngsters of today are different." He added: "If you say to a recruit you can't have a stereo in your room for six months [during training] they aren't going to do it". Sir Anthony acknowledged discipline was essential in military life, but added: "In my view 'punishment' is not a word that is appropriate in today's Armed Forces." The review also detected "inconsistency and confusion" in guidance about sexual relations in the ranks. Sir Anthony said there must be zero tolerance of sexual harassment, but a recognition about the realities of life. "When you put young, red-blooded boys and girls together, they tend to form relationships," he said. "If recruit A goes to location A and there's a condom machine available, but recruit B goes to location B and there's no condom machine - what is the best practice?"